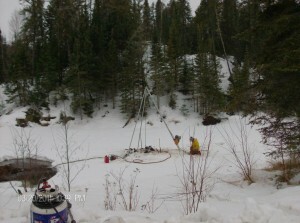 Coring 900 ft. (275 m) “N” Wireline. Rig design allows for easy troubleshooting and maintenance, resulting in minimal operational downtime. Light weight hydraulically powered mobile reconnaissance drill. 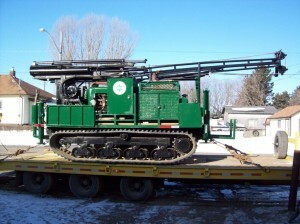 Can be easily disassembled, is helicopter portable, and transports effortlessly to remote drill sites. Applications include shallow geotechnical and environmental drilling. 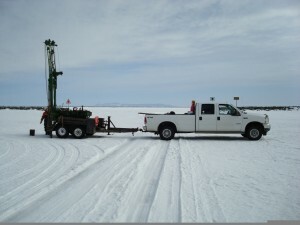 Rig can mounted on skid, trailer, ATV or in a truck box. Powered by a Kohler Command CH22 – 22 HP gasoline engine. Capable of drilling hollow and solid stem augurs. Economical, efficient rig that can drill solid or hollow-stem augers. Can be mounted on a truck, trailer or ATV carrier to allow for damage free movement on paved surfaces and sensitive grassy areas. Ideal for shallow environmental and geotechnical drilling in parking lots, gas stations, residential areas, etc. Short tower is ideal for use in limited overhead clearance projects (low clearance drilling). Can drill holes up to 13 inches [33 cm] in diameter. Power is provided by a deck-mounted Wisconsin 4 cylinder gas engine. Capable of rock coring with BQ or NQ rod sizes and wash bore drilling. Rig has the power, versatility, and dependability to handle geotechnical and environmental jobs with maximum efficiency – a drilling industry staple! The machine’s large foot print & low centre of gravity make it ideal for navigating through difficult and remote terrains including forests and swampy areas. Low impact rubber tracks allow for damage free movement on paved surfaces and sensitive grassy areas. Ideal size and manoeuvrability allows for excellent access to confined sites and parking lots. Able to drill solid and hollow stem augurs and can take on projects that involve rock coring (BQ or NQ), wash boring, and tri cones. TBTE’s most powerful rig - the ultimate all terrain vehicle for drilling in remote locations including forests, swamps, bogs, mudded areas, and mountains. Easily transportable – the rubber tires will not damage paved surfaces. Mounted on a 4 wheel drive Flotation carrier (7.2 psi ground pressure). Low ground bearing pressure means less impact on the environment. Extremely important in environmentally sensitive areas such as parks, farms or golf courses. Dependable mechanical rotary has 13,000 foot pounds [17,628 Nm] of torque for auger drilling holes up to 16 inches [41 cm] in diameter. Powered with a Ford 300 inch 6 cylinder turbocharged diesel engine. Ideal for air rotary drilling, mud rotary drilling, and hollow / solid-stem auger applications. 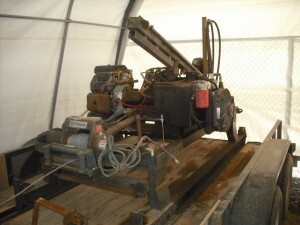 Can setup for wire line bedrock coring. 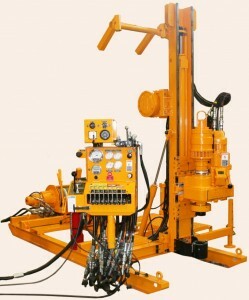 Features a quick disconnect mast for drilling in low overhead areas. Hydraulic automatic hammer offers consistent blow counts. Commonly used for geotechnical and environmental drilling and sampling programs, installation of monitoring wells and piezometers, and pressure-meter testing of soil and bedrock. Capable of rock coring with BQ or NQ rod sizes. Consists of an aluminum Tripod system which is capable of mounting a motorized cathead to one of the legs. Tripod system can drive continuous split spoons or NW size drill casing, if required. 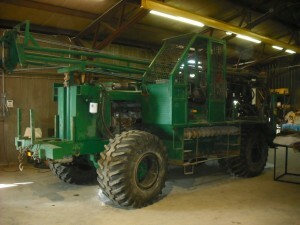 This unit is beneficial in areas of bog where an all terrain vehicle is unable to travel. The space requirements for this unit are approximately 12 feet in diameter and 10 feet of height. 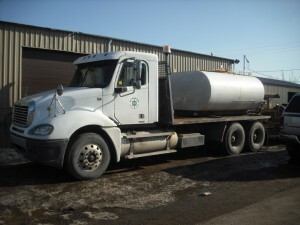 Easily transportable – low transportation costs. Capable of carrying up to 5,000 lbs. Typically used for soil sampling programs. 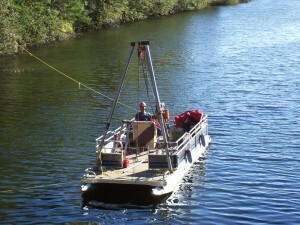 Other uses include bridge inspections and painting applications, sediment sampling, and dock installations. Uniquely constructed to carry out geotechnical and environmental marine investigations.